by Doniella Maher, Cañada College Executive Committee Rep.
On December 22, 2017, signature gathering began to qualify an initiative for the November ballot to make California Colleges free again. Early supporters of the initiative include the California Federation of Teachers (including your local, AFT 1493), the UC Student Workers Union, and a wide variety of community organizing groups. CFT has pledged $50,000 to help get the measure on the ballot. This is not the first time we have fought for free college education. 50 years ago, in the midst of national struggles for civil rights, social reformers in California sought to ensure access to higher education for all. In 1960, the California Master Plan for Higher Education put forward a vision and a process to ensure that California postsecondary education would be available to all students who were “capable of benefiting from instruction”. Along with ensuring that students would be able to attend either the UC system, the California State system or the California community college system, the plan also banned tuition in an attempt to prevent cost from being a barrier to post-secondary education for California residents. Fifty years later, cost has become one of the major reasons students cannot attend college. 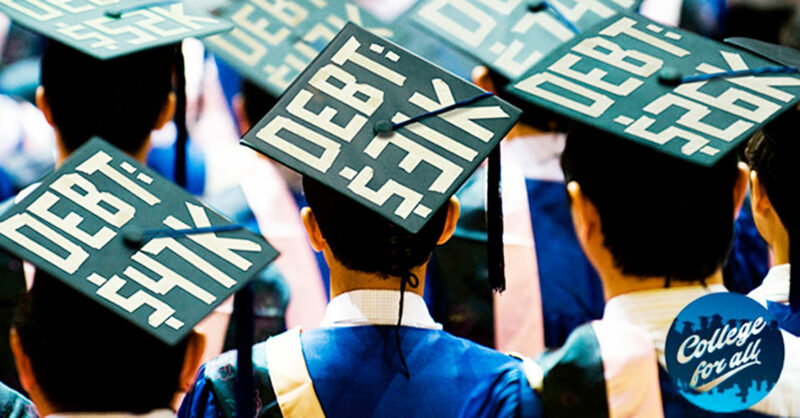 If they choose to go, they are saddled with debt that is difficult to repay for the large majority of students. While the schools still cannot collect tuition, they are allowed to collect fees for other costs, and over time, as public post-secondary institutions have faced decreasing funding from state and federal governments, those fees have increased exponentially. The prohibitive cost of college, which has been a problem for many years, has finally been pushed to the forefront in college reform struggles over the last several years thanks to a larger general discussion about the increasing income gap. In fact, it shouldn’t be that surprising that two of the places first to implement some form of “free college” were New York state and San Francisco, places in which the disparity between those who have and those who have-not is most stark. New York’s measure promises free tuition for families earning $110,000 or less per year (and will increase to $125,000 per year in 2019). San Francisco’s measure, while serving a smaller number of students since it is a city-wide measure and not a state one, offers free tuition to ALL students. The “College for All” Initiative will create a grant that will cover the undergraduate tuition for all Californians who attend a UC, CSU or California community college. In addition, it will also increase the maximum Cal-grant aid that provides support for living expenses while attending college. The initiative is based on the implementation of an estate tax. Currently, there is no estate tax in California. In fact, according to the bill, high-wealth estates have paid no estate tax since 2005. The estate tax proposed for funding the “College for All” initiative is a “high-value estate tax” on amounts over $7 million ($3.5 million for individuals). This is only the top 0.2% of Californians. The “College for All” initiative, while in its initial stages, is an important first step toward making college affordable again for many Californians. Whatever happens in November, we can be sure that ensuring access to quality postsecondary education is a fight that we should be invested in.